I realized when I woke up this morning that I missed meeting some of the guys for breakfast. What a bummer. I was really looking forward to it, but for some reason my body decided it needed more sleep than I wanted to give it. My body won. I had no plans for the rest of the day, and I am not planning anything tomorrow so I can watch the USA v. Canada Olympic hockey final. The race from Las Vegas is on too, but I’m pretty sure Jimmie Johnson is going to win, so why bother watching, right? Go USA! We watched intently today while Hawaii awaited the tsunami, but thankfully it was minor. I spent a year in Hilo, Hawaii going to college. It’s a beautiful city that was completely devastated by a tsumani back in 1960. I’m glad they didn’t suffer from the same result this time. I made bacon-wrapped chili dogs for dinner this evening, and I got to thinking afterward, I am going to have to post that recipe. Everything tastes better cooked with a pound of bacon! I was shocked to learn that Rep. John Linder (R-GA) is retiring from Congress. He was a champion of the Fair Tax movement, and I really hope someone picks up the torch, because something has to be done about our current tax code. “I made the decision last Tuesday night and notified my staff Wednesday morning. I told them not to share the news because I planned to make the announcment during a speaking engagement Saturday,” said Linder. Gwinnett GOP manager David Hancock said the announcement, which came at the end of brief speech by Linder, caught attendees off-guard. “You can’t keep doing things forever and I never intended to stay as long as I did,” said Linder. “Eighteen years is a long time,” he said. Funny isn’t it? The most effective and ethical leaders are the ones who know when it’s time to step down. Congress was not meant to be a “career path”, and hopefully in the future we can persuade others it’s time for them to go too. Yesterday was an incredible day. Our middle son, who is 10, finished reading the entire Harry Potter series of books and as a reward for his dedication to reading, I offered him his choice of location for a day of birding. 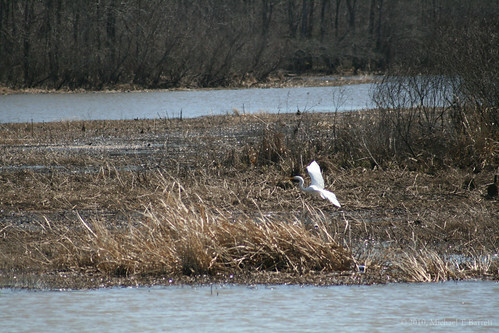 He chose the Eufaula National Wildlife Refuge. 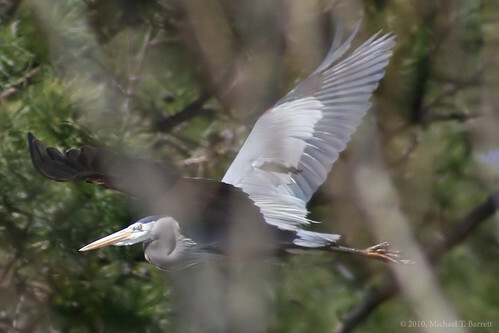 We learned about Eufaula NWR from a friend of ours, Jim Enterkin, at a recent Sweetwater Camera Club meeting. Since the day he told us about all the birds he saw when he visited the refuge, the boys had been anxiously awaiting yesterday’s trip. It was only natural that we would invite Jim to make the trip with us, so he could see more birds too! We departed at 6:00 in the morning and arrived for a quick stop at West Point Lake at 7:30 to see if we could spot a few Bald Eagles before continuing on to Eufaula. We were out of the truck no more than three minutes when Jim spotted one mature, and one immature Bald Eagle sitting in a tree. 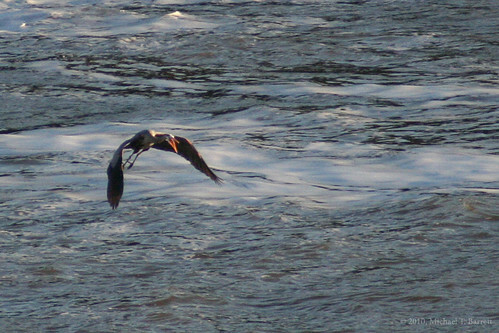 They called out to each other and then flew for a few minutes, landing in a tree directly across the river from us, making our stop a great start to a very incredible day. 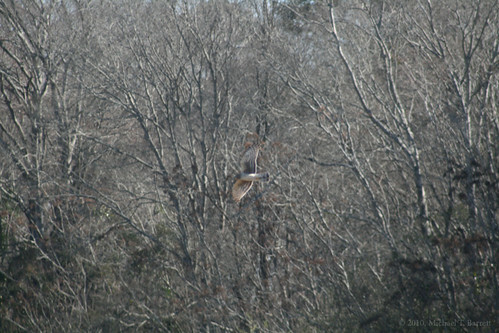 In fact, our photos show a second adult Bald Eagle sitting in the tree where they landed. We were not in a good position to get ‘great’ photos, but it was an awesome sight. What a great start to an incredible day! After a quick bathroom break, in heated bathrooms nonetheless, we continued on to the wildlife refuge. We were 10 minutes out from the refuge headquarters when we spotted another Bald Eagle flying over some water. 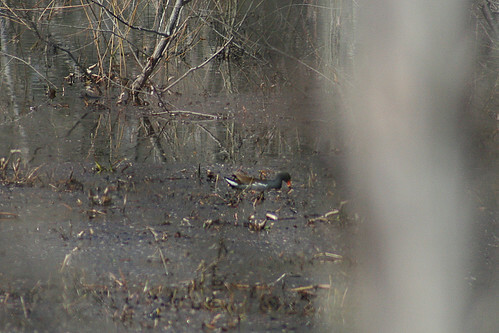 Moments later, we arrived at the refuge headquarters to learn what birds had been sighted in the area. The ranger told us about other wildlife in the area, but the sighting of the Bald Eagle only pumped us all up for the adventure we were just beginning, so we didn’t pay much attention to the “other wildlife” part. It didn’t take long to spot Eastern Bluebirds, American Robins, American Crows, Chipping Sparrows, a Purple Martin, an Eastern Phoebe, Northern Mockingbirds, Common Grackles, and a few Palm Warblers. 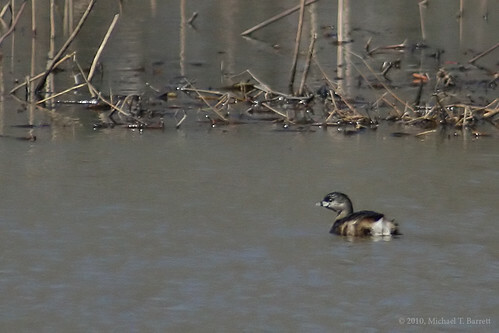 At the first pond we were able to view a solitary Canvasback, half a dozen killdeer, a dozen Ringnecked Ducks, and five Buffleheads. While we were observing the ducks, our youngest spotted something flying above the grass trying to stir something up. 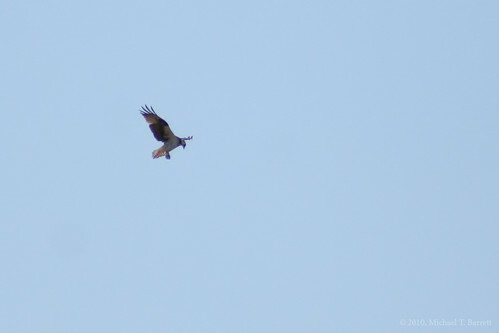 It turned out to be a Northern Harrier trying to rustle up some grub. We spotted a total of six Northern Harriers in the area, along with a Red-Shouldered Hawk and a couple Red-Tailed Hawks. As we were observing two Northern Harrier’s in a tree, we had a couple little friends who kept popping up around the truck. 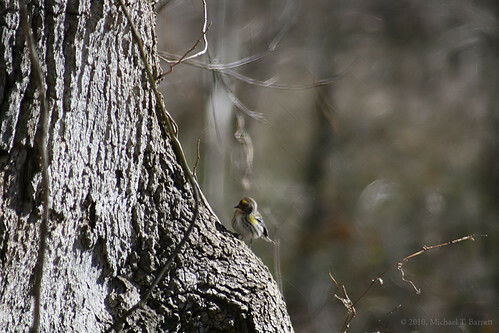 A total of five Yellow-Rumped Warbler’s were hanging out with us at that point in the wildlife refuge. The roads were all dry and clear, but the “summer” routes were not open and won’t be opened until March 1st, so we were “forced” to walk part of the road in the Houston Unit. 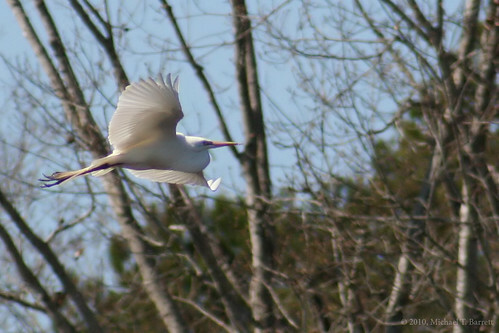 Jim told us that they had seen dozens of Great Egrets when he was at the same location just a few months ago, and just steps down the road, the egrets began to fly. And boy, did they fly! 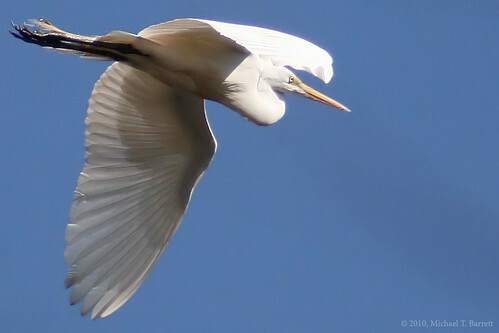 We saw a total of 26 Great Egrets along with three Anhinga, 15 Great Blue Herons, numerous Northern Shovelers, Double-Crested Cormorants, hundreds of American Coots, several Common Moorhens, and quite a few Pied-Billed Grebes. 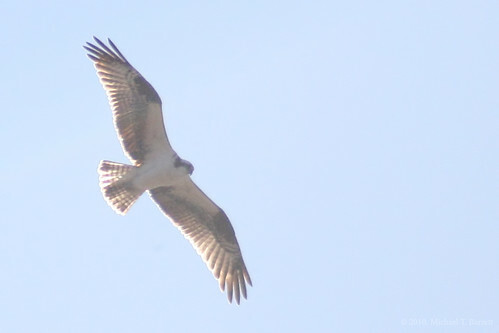 At one point a couple of Osprey decided to check us out as we walked back along the road. I love how they hover when they check out the water for their next meal. 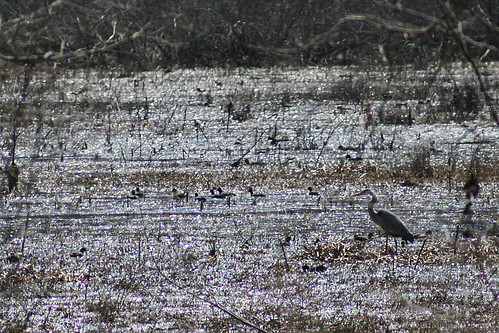 The Osprey wasn’t the only bird that flew close to see what we were doing on their turf. After visiting the Houston Unit, we decided to eat lunch in Eufaula, Alabama, and then venture over to the Bradley Unit on the Georgia side of the refuge. We saw more Great Egrets, Great Blue Herons, Ring-Necked Ducks, Bufflehead, Wood Ducks, American Coots, and Common Moorhens. Just moments after snapping this shot, we heard something rustling on the shore next to the road. We glanced down in time to see a 5.5-6 foot alligator go running into the water. It was 15 feet away from us. That’s when we remembered the “other wildlife” part of what the ranger had to say. She mentioned some rather large alligators sunning themselves on the banks of the water and on the side of the roadways. As we walked back toward the truck, we joked with each other about not slowing down. None of us wanted to be the guy in back, in case that gator decided to give chase. As I said when I started this post, it was an incredible day. I added five new birds to my life list, the boys added 6 to theirs, and we all had a great time, even after we took this final photo at the refuge. Notice the “visitor” in the foreground of the photo. 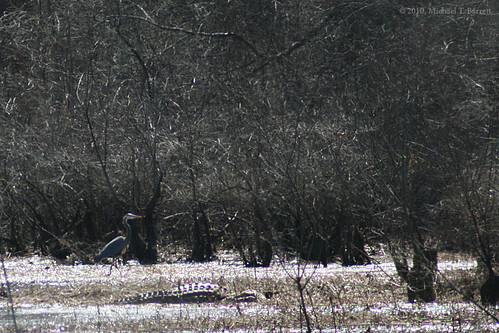 Do Great Blue Herons not see bumpy backed alligators if they hide their heads under some vegetation? Even though that gator was quite far away from us, it was large enough to make us rethink sticking around any longer. None of us were interested in tempting fate and becoming a dinner item at the Bradley Unit that day. We still had a few hours to spare, so we drove down to the Walter F. George reservoir dam, but didn’t see too much while we were there except some deer, a lot of Ring Billed Gulls, Double Crested Cormorants, and a few barking Great Blue Herons. It took us a little over three hours to get home and call an end to one of the best birding days any of us had seen in a long, long, time. Of course, now that we’re all rested, we’re ready to head down there again. Soon. Very soon. In a daring attempt to escape the mundane cycle of everyday life, I have run away today and won’t be back until tomorrow.